Ron Clancy, author of the beautiful Christmas Classics series of Christmas carol books, has now created a number of "The Story Behind The Music" videos recounting the histories of several Christmas carols. Three were released in late July 2009; other titles were released from early November through early December. Are are available at YouTube. Christmas Classics Ltd. cheerfully supports the Fisher House Foundation. Chapter 6. Do You Hear What I Hear? The videos, available on his website, provide compelling, little-known personal stories behind the music and act as a partner for Clancy’s American Christmas Classics boxed set-collection spanning 200 years of American Christmas music. The stories, mostly about traditional gems found in the collection, are also about a few carols from his first title Best-Loved Christmas Carols and his fourth book/CD collection Sacred Christmas Music. The music collection, one of the largest and mostly highly copyright protected ever assembled for public sale, represents both secular and religious favorites written in America. Ron Clancy’s life long dream to create the classics collections combining historical perspective, fascinating stories, period art, song lyrics, and music CDs is a reality and is further augmented by the production of the videos. The author’s travels started in Savannah, GA, and the “Jingle Bells” Church where the song’s composer, who fought for the Confederacy while his brother fought on the Union side in the Civil War, was music director. Clancy then visited St. Helena, SC, once a port of call for the slave trade, where the spiritual “Mary Had a Baby” may have originated. American Christmas Classics special boxed set and 3 CDs is not available in stores but can be ordered from the website for $29.95 - half off the suggested retail price. There is no better way to celebrate the Christmas holiday than with hours of the most popular Christmas music in the country and a better understanding of how that music was written. 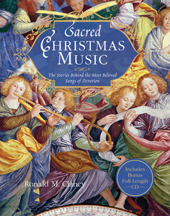 For more information, visit http://www.christmasclassics.com or call 1-866-552-7742 toll free to order. "Rudolph" & "Rockin' Around the Christmas Tree"
"Christmas Eve in My Hometown"
This video describes the Christmas Classics-Millennia Collection Series, a series of books with stories describing the origin of Christmas music, carols, and songs with special emphasis on American contributions to the international repertoire. Inspired by those who nobly served our country, especially the veterans of World War II. I do not have any financial or other relationship with Ron Clancy, The Christmas Classics™, or YouTube™.